Meena Harper was already running late and she thought she would enter a train that would have been crammed with people but to her surprise it was practically empty. It would be her lucky day if in her train ride she can avoid eye contact and human interaction all the way till fifty-first street stop. Unfortunately something caught her attention, a girl with white pumps that had life size plastic butterflies on the toes. She was definitely out of town as there was a roller suitcase in front of her. When she saw Meena, she removed her purse to offer the seat next to her. That was when Meena's heart sank because that girl was going to die by the end of the week. Meena took the seat and striked a conversation with Miss Butterfly. Meena asked her was it her first time visiting the city and the girl took out her mobile and showed Meena the picture of her American boyfriend. She said that the guy was going to help her obtain visa. Miss Butterfly also mentioned that her boyfriend will help her become a model/actress at the same time. Grand Central Station was announced in the loudspeaker and it was where Yalena (Miss Butterfly) was meeting her boyfriend. Meena searched through her handbag and produced her name card telling Yalena that if she ever found herself in need of help just call her. Meena being kind hearted went down the train and helped Yalena with her suitcase. As she bid her goodbye, she reminded Yalena that she could call anytime but keep this card a secret from her boyfriend. After that, Meena headed back to trains to take a new one to her destination where she was going to be late for her work. As usual Meena grabbed her morning coffee and bagel before heading into the office. Today she hoped would be a good day as the head writer position for "Insatiable" was available. Meena worked hard all the time and it's time she got a promotion as she needed more money for her apartment loan. It was an apartment bought by her and her ex but then things didn't turn out well so now it's Meena's and she's paying for the place. Other than that, her brother who lost his job to the recession is living with her and Jon had no luck looking for new jobs. While Meena was eating her bagel, her colleague popped in and broke the news that Shosona is the new head writer. Shosona does not produce good work and always leaving work early. But Meena thought it isn't a surprise since her aunt and uncle are the executive producers and co creators of "Insatiable". Meena head into Sy's office which is her boss as they had an appointment. The meeting was to let Meena know that the network is going to change the direction of the TV series as they were losing viewers to a show called "Lust" which had vampires as their main story line. With that show ratings going up, it's naturally that "Insatiable" will include a vampire as the main actress' love interest from now on. Meena was upset with this direction as she has always loved how "Insatiable"'s story was and hated vampires because it was not real in the first place. But she had no choice as if she wants to keep her job she would have to listen to the new head writer now. Lucien Antonescu is a professor who teaches history in the University of Bucharest. He teaches at evening time and many female students who takes this class is not really interested in history but with Lucien himself as he is the most handsome professor and the girls all feel that they will melt when he is around. One of his students was asking him a question on the history of Romania and then he got a phone call suddenly which made him so furious that he chased that student away. The student was terrified as she thought she saw his eyes turned red with anger and usually Lucien is a very nice professor which have never throw his temper like that. The student tried to pry into the office to check on the situation but the professor simply disappeared into thin air. Lucien received news that someone in New York is killing girls in the way that will reveal his secret to the world. And that is the existence of vampires in reality. As the prince of darkness, he will have to investigate who is disobeyed him and might bring chaos to the order that he has maintained for hundreds of years. Lucien had no choice but to fly to New York to solve the problem himself. Meena had a terrible day where she did not get the job she wanted and then in the afternoon she was invited to a dinner party hosted by her neighbor which she usually want to avoid. As she reaches her apartment building, she scouts around hoping that today of all days she would have a quiet ride in the elevator, but right as she enters her neighbor Mary-Lou shows up and for the whole ride she has been talking about "Insatiable" giving Meena all the ideas to add into the show. Mary-Lou also asked Meena whether she will be attending the party and Meena has yet to decide. That night Meena could not sleep as she worries about Yalena so at 4 am in the morning she took her dog for a walk out in the streets. As she nears the church, she saw a handsome man across the street and thought why would there be someone out so late. As she turns to look at the church which was under renovation, suddenly Meena could feel danger coming her way. A colony of bats were flying towards her and things happened so fast she thought she was going to die from the attack. The screeching of the bats were so loud and she could hear thudding at the back, the handsome man which she saw earlier was hugging and protecting her from the attack. Meena couldn't stop thinking that this man is going to die for her and it was scary. What's to happen to that man? Why didn't Meena foresee his death? 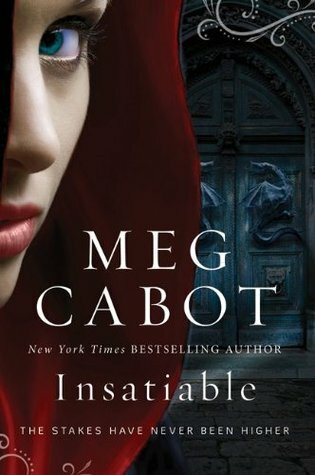 Insatiable by Meg Cabot is not your typical vampire story, it's mysterious, packed with romance and lots of action. When I first heard of this book, I thought "Oh why she followed the trend of "vampires" and came out with a book like this", I wasn't interested at all. But then being Meg Cabot's loyal reader I bought the book to give it a try. This book is not about the vampire but about a special girl who has special powers but not a pleasant power at all. Meena has a power which can see the future, but only one aspect which is when someone is going to die. It's not a power that benefits herself but to help people. This book does not have one main male character but two who are enemies. I love how the female interest of this book has two male interest for her. I love how a demon hunter is introduced in the story too that it's not about the vampires being vegan or good ones but they are bad in general and the good guys are the demon hunters. It's very hard to describe how much I love this book, I can truthfully say this is one of my favorite from Meg Cabot and the story is just unique to me. I know there's a vampire theme to it but I feel this book is better than twilight. I do like twilight but Meg Cabot has always been my favorite writer as she not only has romance, she includes mystery, action and also humor to her stories. 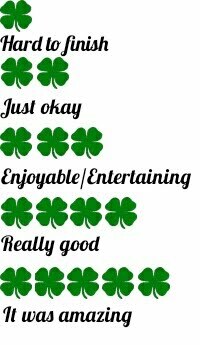 I felt that the plots of the story went really smooth, the climax totally got me excited. I had no expectations for this book but it totally captured my heart. I have purchased "Overbite" which is the sequel and I can't wait to read it after I'm done with my current book. I really love the characters of the book, especially Meena and Alaric. Looking forward to see how their relationship evolves. I will definitely re-read this as when I was reading it, I repeat some chapters.